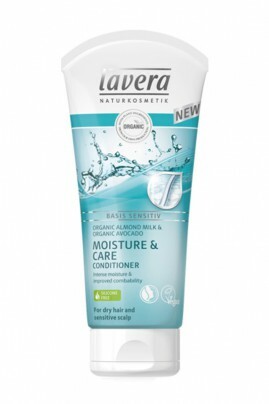 Lavera Moisture & Care Conditioner makes dry hair naturally beautiful ! The especially mild formulation with organic almond milk and organic avocado moisturises and is gentle on hair and scalp. With Lavera Vegan Hydrating & Care Hair Conditioner, your hair are visibly smoother and easier to comb ! Déçu de cet achat, c'est après shampooing ne donne pas le résultat voulu, mais cheveux ne sont pas doux et brillant. Ideal for for dry hair & sensitive scalp ! After applying Lavera Hydrating & Care Shampoo, massage a walnut-sized of Lavera Hair Conditioner amount into freshly washed hair using your fingertips, leave for 2 to 3 minutes then rinse thoroughly. Clean composition with natural & organic ingredients ! Odeur pas top mais super apres shampoing/masque si on le mélange à une autre huile pas trop grasse!